The term hearing describes the process, function, or power of perceiving sound. Hearing is second only to vision as a physiological sensory mechanism to obtain critical information during the operation of an aircraft. The sense of hearing makes it possible to perceive, process, and identify among the myriad of sounds from the surrounding environment. 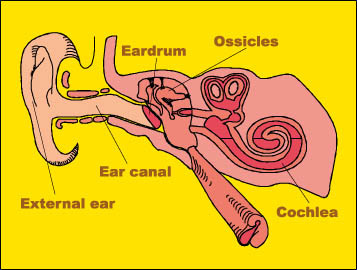 Anatomy and Physiology of the Auditory System The auditory system consists of the external ear, ear canal, eardrum, auditory ossicles, cochlea (which resembles a snail shell and is filled with fluid), and the auditory nerve. Ambient sound waves are collected by the external ear, conducted through the ear canal, and cause the eardrum to vibrate. Eardrum vibration is mechanically transmitted to the ossicles, which, in turn, produce vibration of a flexible window in the cochlea. This vibration causes a pressure wave in the fluid located inside the cochlea, moving thousands of hair-like sensory receptors lining the inner walls of the cochlea. The movement of these receptors resembles the gentle movement of a crop field caused by the wind. The stimulation of these sensors produces an electrical signal that is transmitted to the brain by the auditory nerve. This signal is then processed by the brain and identified as a particular type of sound. The term sound is used to describe the mechanical radiant energy that is transmitted by longitudinal pressure waves in a medium (solid, liquid, or gas). Sound waves are variations in air pressures above and below the ambient pressure. From a more practical point of view, this term describes the sensation perceived by the sense of hearing. All sounds have three distinctive variables: frequency, intensity, and duration. Frequency is the physical property of sound that gives it a pitch. Since sound energy propagates in a wave-form, it can be measured in terms of wave oscillations or wave cycles per second, known as hertz (Hz). Sounds that are audible to the human ear fall in the frequency range of about 20-20,000 Hz, and the highest sensitivity is between 500 and 4,000 Hz. Sounds below 20 Hz and above 20,000 Hz cannot be perceived by the human ear. Normal conversation takes place in the frequency range from 500 to 3,000 Hz. Intensity is the measurement of pressure, or loudness. The decibel (dB) is the unit used to measure sound intensity. The range of normal hearing sensitivity of the human ear is between -10 to +25 dB. Sounds below -10dB are generally imperceptible. A pilot who cannot hear a sound unless its intensity is higher than 25 dB (at any frequency) is already experiencing hearing loss. Duration determines the quality of the perception and discrimination of a sound, as well as the potential risk of hearing impairment when exposed to high intensity sounds. The adverse consequences of a short-duration exposure to a loud sound can be as bad as a long-duration exposure to a less intense sound. Therefore, the potential for causing hearing damage is determined not only by the duration of a sound but also by its intensity. The term noise refers to a sound, especially one which lacks agreeable musical quality, is noticeably unpleasant, or is too loud. In other words, noise is any unwanted or annoying sound. Categorizing a sound as noise can be very subjective. For example, loud rock music can be described as an enjoyable sound by some (usually teenagers), and at the same time described as noise by others (usually adults). The aviation environment is characterized by multiple sources of noise, both on the ground and in the air. Exposure of pilots to noise became an issue following the introduction of the first powered aircraft by the Wright brothers and has been a prevalent problem ever since. Noise is produced by aircraft equipment-powerplants, transmission systems, jet efflux, propellers, rotors, hydraulic and electrical actuators, cabin conditioning and pressurization systems, cockpit advisory and alert systems, communications equipment, etc. Noise can also be caused by the aerodynamic interaction between ambient air (boundary layer) and the surface of the aircraft fuselage, wings, control surfaces, and landing gear. These auditory inputs allow pilots to assess and monitor the operational status of their aircraft. All pilots know the sounds of a normal- functioning aircraft. On the other hand, unexpected sounds or the lack of them, may alert pilots to possible malfunctions, failures, or hazards. Every pilot has experienced a cockpit or cabin environment that was so loud that it was necessary to shout to be heard. These sounds not only make the work environment more stressful but can, over time, cause permanent hearing impairment. However, it is also important to remember that individual exposure to noise is a common occurrence away from the aviation working environment-at home or work, on the road, and in public areas. The effects of pre-flight exposure to noise can adversely affect pilot in-flight performance. Steady: Continuous noise of sudden or gradual onset and long duration (more than one second). Examples: aircraft powerplant noise, propeller noise, and pressurization system noise. According to the Occupational Safety and Health Administration (OSHA), the maximum permissible continuous exposure level to steady noise in a working environment is 90 dB for eight hours. Impulse/Blast: Noise pulses of sudden onset and brief duration (less than one second) that usually exceed an intensity of 140 dB. Examples: firing a handgun, detonating a firecracker, backfiring of a piston engine, high-volume squelching of radio equipment, and a sonic boom caused by breaking the sound barrier. The eardrum may be ruptured by intense levels (140 dB) of impulse/blast noise. Ear discomfort may occur during exposure to a 120 dB noise. Ear pain may occur during exposure to a 130 dB noise. Eardrum rupture may occur during exposure to a 140 dB noise. Temporary hearing impairment. Unprotected exposure to loud, steady noise over 90 dB for a short time, even several hours, may cause hearing impairment. This effect is usually temporary and hearing returns to normal within several hours following cessation of the noise exposure. Permanent hearing impairment. Unprotected exposure to loud noise (higher than 90 dB) for eight or more hours per day for several years, may cause a permanent hearing loss. Permanent hearing impairment occurs initially in the vicinity of 4,000 Hz (outside the conversational range) and can go unnoticed by the individual for some time. It is also important to remember that hearing sensitivity normally decreases as a function of age at frequencies from 500 to 6,000 Hz, beginning around age 30. Subjective Effects: Annoying high-intensity noise can cause distraction, fatigue, irritability, startle responses, sudden awakening and poor sleep quality, loss of appetite, headache, vertigo, nausea, and impair concentration and memory. Speech Interference: Loud noise can interfere with or mask normal speech, making it difficult to understand. Performance: Noise is a distraction and can increase the number of errors in any given task. Tasks that require vigilance, concentration, calculations, and making judgments about time can be adversely affected by exposure to loud noise higher than 100 dB. Limiting Duration of Exposure to Noise: OSHA-established permissible noise exposure limits for the workplace(Fiugure 2) (including the cockpit of an aircraft). Use Hearing Protection Equipment. If the ambient noise level exceeds OSHA's permissible noise exposure limits, you should use hearing protection devices-earplugs, earmuffs, communication headsets, or active noise reduction headsets. Even if an individual already has some level of permanent hearing loss, using hearing protection equipment should prevent further hearing damage. These protection devices attenuate noise waves before they reach the eardrum, and most of them are effective at reducing high-frequency noise levels above 1,000 Hz and/or for reducing noise levels to, or below, 50 dB. It is very important to emphasize that the use of these devices does not interfere with speech communications during flight because they reduce high-frequency background noise, making speech signals clearer and more comprehensible. Earplugs. Insertable-type earplugs offer a very popular, inexpensive, effective, and comfortable approach to provide hearing protection. To be effective, earplugs must be inserted properly to create an air-tight seal in the ear canal. The wax-impregnated moldable polyurethane earplugs provide an effective universal fit for all users and provide 30 to 35 dB of noise protection across all frequency bands. Communication Headsets. In general, headsets provide the same level of noise attenuation as earmuffs, and are also more easily donned and removed than earplugs, but the microphone can interfere with the donning of an oxygen mask. Active Noise Reduction Headsets. This type of headset uses active noise reduction technology that allows the manipulation of sound and signal waves to reduce noise, improve signal-to-noise ratios, and enhance sound quality. Active noise reduction provides effective protection against low-frequency noise. The electronic coupling of a low-frequency noise wave with its exact mirror image cancels this noise. This article is adapted from a pamphlet of the same name in the series "Medical Facts for Pilots," developed by FAA's Civil Aeromedical Institute. If you want additional copies or more information on hearing, contact CAMI's Aeromedical Education Division, AAM-400, P.O. Box 25082, Oklahoma City, OK 73125. Dr. Antuñano manages CAMI's Aeromedical Education Division; Mr. Spanyers is a physiology instructor in the same organization.